The Boston Marathon draws thousands of runners and spectators each Patriots' Day—the third Monday in April. The 123rd Boston Marathon is April 15, 2019. 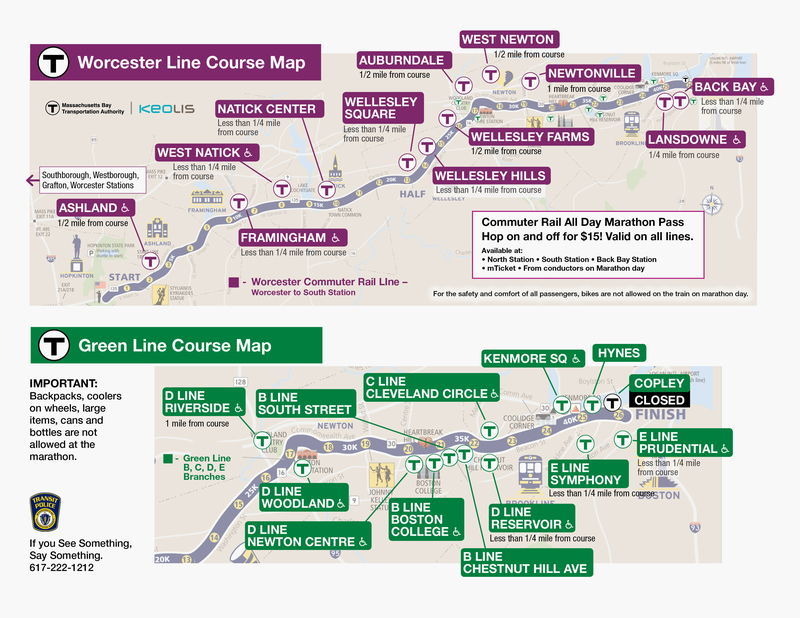 Spectators can access almost the entire marathon course on the MBTA. For added convenience, all subway lines and the Silver Line will run additional service before and after the marathon. We're also offering a $15 Marathon Pass for Commuter Rail. The unlimited all-day pass is valid for all Commuter Rail lines and zones. Learn more about paying your fare. We want to ensure your safety along the course. Additional MBTA staff and Transit Police will be available at MBTA stations throughout the day. Here are some other things you should know about using the T on Marathon Monday. Are you running in the marathon? Learn more about getting to the starting line. Many stops along the Framingham/Worcester Line are less than a half-mile from the course, and the Green Line C Branch runs parallel to it. We offer unlimited travel passes, including a $15 Marathon Pass for Commuter Rail, to help you get around. We recommend loading enough money on your CharlieCard or CharlieTicket ahead of time, and paying with a credit or debit card, to reduce lines in stations. For the day of the marathon, we recommend loading enough money on your CharlieCard or CharlieTicket for a round trip on the subway—about $5. We encourage paying with a credit or debit card to reduce lines in stations. Save time by purchasing a preloaded $5 CharlieCard using a credit or debit card from one of our Transit Ambassadors at Alewife, Back Bay, Braintree, Fenway, Quincy Adams, or Riverside. CharlieCard fares cost less than fares paid with a CharlieTicket. For an all-day pass: We offer 1-day passes valid for unlimited subway and bus trips for $12—equal to the cost of about 4 subway trips. You can buy them at fare vending machines at subway stations. Here all week? Our 7-day LinkPasses are $21.25—equal to the cost of about 9 subway trips. You can buy them at fare vending machines at subway stations. Buy tickets or passes on the mTicket app, at fare vending machines in subway and some Commuter Rail stations, or from conductors on board the train with cash or credit. An all-day $15 Marathon Pass is valid for all Commuter Rail lines and zones, with unlimited hop-on and hop-off travel. Note, this pass is not valid for the subway and bus. Get your pass early on the mTicket app (starting April 8) or at ticket windows at North, South, and Bay Back stations (starting April 10). The day of the race, you can get it on board the train, too, with cash or credit. Did you know? If you’re in town the weekend before the marathon and interested in exploring the area, a $10 weekend pass is valid for unlimited travel on all Commuter Rail lines in all zones on Saturday and Sunday. Driving to the finish line is not recommended. Parking restrictions will be in place throughout Back Bay leading up to and on the day of the marathon. You can park at an MBTA station and take the subway or Commuter Rail in. Daily parking rates are $2 – $9, and you can pay in cash, credit, or on your phone. You can check availability at some of the busiest MBTA garages on Twitter @MBTA_Parking. There are 30,000 official entrants for the 2019 Boston Marathon, many from Massachusetts, and many more from across the country and the world. If you’re running this year, congratulations! Here are some things to keep in mind. The only guaranteed transportation for runners from downtown Boston to the starting line in Hopkinton are the Boston Athletic Association buses that leave from Charles Street, between Boston Common and the Public Garden. MBTA service starts around 5 AM, and there are several options for getting to the BAA pick-up point on Charles Street. Green Line service starts around 5 AM. We recommend checking Green Line alerts before your trip. Take the Red Line to Park Street to access Boston Common. Red Line service is scheduled to start around 5 AM. We recommend checking Red Line alerts before your trip. It’s a short walk to Boston Common—or you can transfer to the Red Line and take it 1 stop to Park Street to exit directly onto the Common. Orange Line service is scheduled to start around 5 AM. We recommend checking Orange Line alerts before your trip. Take any Commuter Rail line into the city—routes north of Boston go to North Station, routes south of Boston go to South Station. We recommend checking Commuter Rail alerts before your trip. Back Bay Station is about a 15-minute walk to the pick-up point. From North Station, take the Green Line to Arlington. From South Station, take the Red Line to Park Street and transfer to the Green Line. Take the Green Line to Arlington. A number of buses serve the area, but routes may be detoured around the course. Check bus service alerts for the most current information. There’s nothing like taking in the sights of the marathon on Patriots’ Day, along the course or at the finish line. Plus, you can take the bus and subway all day with our 1-day pass—or use our special $15 Marathon Pass to hop on and off the Commuter Rail all day. Note, this pass is not valid on the subway and bus. We will be running additional trains on the Framingham/Worcester Line to accommodate more riders. All other Commuter Rail lines will operate a regular weekday schedule. There are plenty of great viewing (and cheering!) locations accessible by public transit. The Red Sox have a home game at 11:05 AM on Patriots’ Day, so trains and stations may be especially crowded before and after the game. A special all-day $15 Marathon Pass is valid for all Commuter Rail lines and zones, with unlimited hop-on and hop-off travel. Note, this pass is not valid on the subway and bus. We recommend checking Commuter Rail alerts before your trip. The Green Line C Branch runs parallel to the course. Take in the best view of Miles 22 – 24, from Cleveland Circle to St. Mary's Street! Kenmore and Hynes get you close to the finish line. Copley Station on the Green Line is closed on Marathon Monday. We recommend checking Green Line alerts before your trip. For fans and family who want to be in the heart of it all, the finish line is one of the most popular spots. It's in front of the Boston Public Library near Copley Square, and there are several ways to get there. Please be aware of security restrictions in the area on Marathon Monday. Take the Green Line to Hynes Convention Center (from Brookline, Newton and points west) or Arlington (from downtown Boston). It’s a short walk to Copley Square from either station. Copley Station on the Green Line is closed on Marathon Monday. Take the Orange Line to Back Bay Station. It’s just a short walk to Copley Square. We recommend checking Orange Line alerts before your trip. A number of bus routes stop close to Copley Square, but keep in mind that due to road closures and heavy traffic, buses may be detoured or delayed. Take your preferred Commuter Rail line into the city. We recommend checking Commuter Rail alerts before your trip. Back Bay Station puts you right in the heart of the action, just 2 blocks from Copley Square. Please follow these guidelines to ensure everyone’s safety and comfort. A number of items are prohibited near the starting line, finish line, and along the course on Marathon Monday. Read the official spectator guidelines for more information. If you need to report an emergency, please call 911 or the Transit Police at 617-222-1212. Alcohol consumption is not allowed on trains, buses, or at any stations. If you are wearing a backpack, remove it and hold it at your side or set it between your feet. Let passengers off the train before you board. Leave large items like bags, coolers, and strollers at home. Bikes (including folding bikes) are not allowed on the subway or Framingham/Worcester Line on the day of the marathon. Bikes are also restricted on the Framingham/Worcester Line starting at 8 PM on Sunday, April 14. Additional MBTA Transit Police officers will be available in and near stations throughout the day. If you need assistance, please report directly to a uniformed official. If you need to report an emergency, call 911 or Transit Police at 617-222-1212.